Following the model of the highly successful World Atlas of Language Structures, the Leipzig team and their colleagues assembled a consortium of linguists who are specialists in 76 pidgin, creole and other languages arising from intensive language contact in the last few centuries. "Experts on understudied languages often work in isolation, but in order to see the bigger picture, we needed to bring their expertise together and create large-scale comparable datasets", explains Susanne Maria Michaelis of the Max Planck Institute for Evolutionary Anthropology. She and her colleagues worked with experts on 25 languages of the Americas, 25 African languages, and 26 Asia-Pacific languages over several years. The result is an atlas of 130 maps showing a selection of grammatical features, plus two dozen maps showing sociolinguistic information as well as a substantial number of maps on the kinds of sound segments used. Many of the maps reveal striking similarities between Caribbean languages such as Jamaican and Haitian Creole and the languages spoken by the slaves who were forced to work for the European colonists from the 17th century. Since the great majority of slaves in the New World colonies were brought from Africa, the Caribbean languages in many ways resemble the African languages. "You cannot see this easily in the words, which typically sound like Spanish, French or English, but closer examination of grammatical patterns such as tense and aspect systems leads us directly to African and Asian languages", says Philippe Maurer of the University of Zurich. For example, in Jamaican, the past tense of action verbs requires no special tense marker, unlike in English: For 'The men dug the hole', Jamaican has "Di man-dem dig di huol". This pattern occurs widely in West African languages. A number of such African patterns can even be found in the vernacular English variety of African-Americans in the United States. "Grammatical structures have the potential to preserve older historical states and thus to serve as a window into the human past, but they are also rather difficult to compare across languages", comments Martin Haspelmath of the Max Planck Institute for Evolutionary Anthropology. "Finding comparative concepts that allow experts coming from different research traditions to characterize their highly diverse languages in a comparable way has been a major challenge." But with the new database and the atlas built from it, researchers can now address a wide variety of questions more systematically. 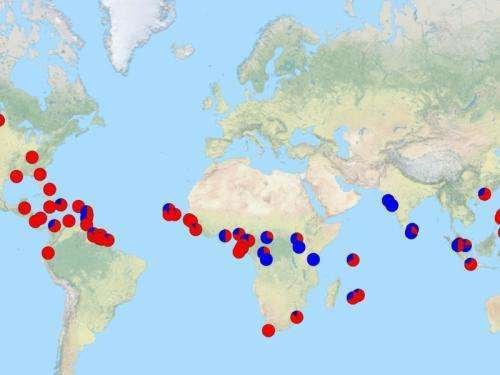 While individual similarities between African languages and the languages spoken by the descendants of the slaves had long been noted, the Atlas of Pidgin and Creole Language Structures now provides far more systematic data on a much wider variety of structural features. "What is striking is that you see the influence of the indigenous languages also in Asia and the Pacific, areas which traditional creolists often neglected", says Susanne Maria Michaelis. For example, in the Portuguese creole variety of Sri Lanka, 'I like it' is literally 'To me it is liking', as in a typical South Asian language. The Atlas of Pidgin and Creole Language Structures was published as a book by Oxford University Press, together with a three-volume Survey of Pidgin and Creole Languages. But most of the structural information of the atlas is also available in online format, published by the Max Planck Institute for Evolutionary Anthropology (apics-online.info). Many supporting materials, such as detailed bibliographical references and example sentences, are only available online.